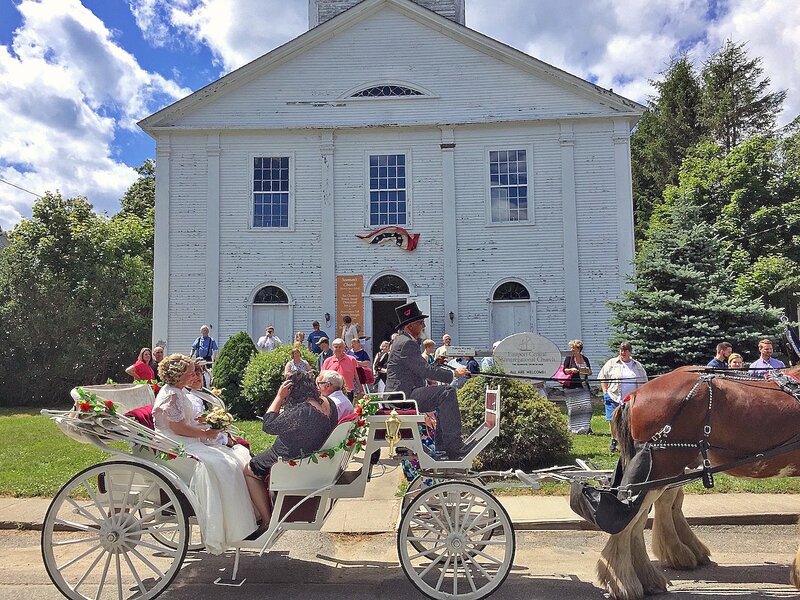 Wedding scene at historic 1828 Seaman’s Church, July, 2017. Make your private event a special one by hosting it at the Tides Institute & Museum of Art (TIMA). Whether it’s an intimate wedding reception, a business meeting or a club event, our historic settings within several of our buildings (ranging from 1819 to 1887) give an event a memorable experience. See our Campus Map for locations and see our Campus Listing for descriptions and photographs of our buildings and park & field site. • 1887 Main Building library reading room: board and club meetings, presentations, receptions. 43 Water Street. • 1828 Seaman’s (Congregational) Church: weddings, receptions and meetings in an historic setting. 26 Middle Street. Wonderful sound for talks, maritime sea chanties, single or trio of string instruments. Handicap accessible. Main sanctuary space available for up to 220 people plus 30 additional people on platform. • 1819 North Baptist Church: receptions and small music performances in an historic setting. 82 High Street. Exceptional chamber acoustics with 23 foot high vaulted ceiling. Balcony available for up to 20 people. Main sanctuary space available for up to 220 people plus 30 additional people on platform. • Deep Cove Park & Field Site: picnics. Deep Cove Road. • 1887 StudioWorks: workshops. 48 Water Street. Facilities rentals are subject to availability. For information and pricing, contact tides@tidesinstitute.org: 207-853-4047.